This replica thatched cottage gives visitors a sense of what daily life must have been like for most people in rural Ireland in the 1800s. People both worked and relaxed near the kitchen hearth. They used the crane to hoist pots of food for cooking over the open fire. Near the warmth of the fire, families sewed, knitted and mended clothes and tools. Rooms beyond the hearth wall were considered to be above the kitchen, while those at the other end were below. These rooms were used as bedrooms, storerooms and occasionally as parlours. In early cottages, animals were sometimes kept in a room at one end of the cottage, while people slept in a bedroom on the other side. The cottage is named after Patrick Ryan, a poet who lived in Camross between 1750 and 1825. He wrote about the natural beauty and the people of this community. 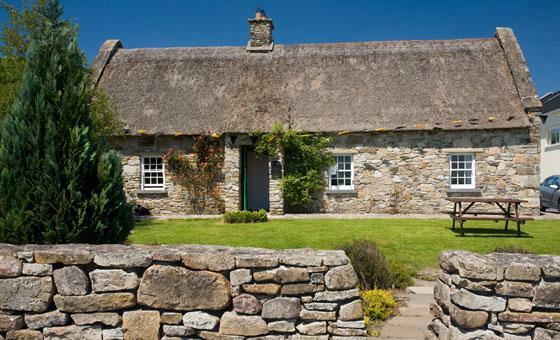 The absolute simplicity of Irish cottages is what makes them beautiful. The stone walls and thatched roofs look completely at home in the countryside, just as this cottage nestles into its flower garden in the heart of Camross.